Maybe I haven't had enough caffeine yet this morning, I'm not sure I completely get it...would you describe this model as descriptive or prescriptive? This made me laugh... because it's true. My only issue with the model is it implies that the only people who get to go on vacation are those who ignore their people and their people's impact on the organization's goals. Really? Should vacation be a reward for doing a GREAT job, not being a half-assed manager? While this model is helpful as a strong wake-up ring due to it's simplicity I think that for most of the managers naming the gray areas would be even more inspiring. These aren't yet the perfect wordings but I think it's important to emphasize that being in the middle isn't sufficient. To me, a good model should speak for itself; so clearly, this one needs either some fine-tuning or an explanation. I’m going to post an update and try explaining the 4 quadrants. Let me know if that does it. Thanks for the feedback, questions, and suggestions! I've been looking at your performance model which is positioned for simplicity, and I'm not sure I quite get it. First. Nagging suggests it has No Impact on performance - my belief is it's likely to have a negative impact. And Vacation. If my nagging boss takes a long vacation - my guess is that my performance would likely improve. Next: Avoiding - head in the sand. 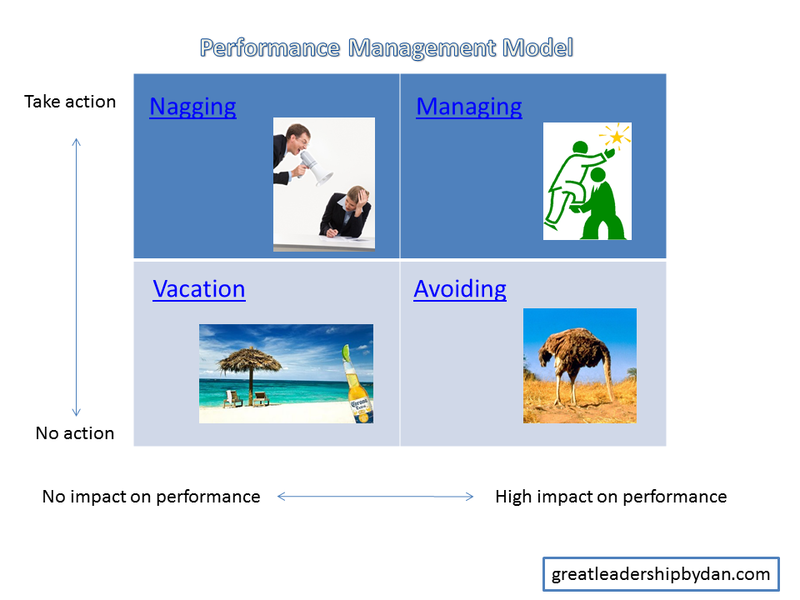 It implies it has a high impact (positive)on performance. However in this case I'm assuming you mean "High" as being a neutral to negative impact on performance. Also "take action" implies initiation needs to occur. I think you're implying that "Action" is naturally occurring in these two quadrants. Maybe I'm being overly critical - but i believe you wanted critical feedback. Thanks for the feedback. I've since written an update that may address your points - please let me know. Thank you for this post! The matrix is great for explaining what is an efficient performance management. This is the Blake Mouton Managerial Grid. 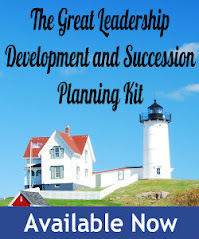 It's a very useful tool for determining your leadership style, or your bosses' and peers styles, or even your subordinates' styles so you can develop them into future leaders. The military teaches junior leadership this model for exactly this reason. Thanks, I appreciate your comment, but it's not Blake Mouton at all, other than it's a management grid. I agree, the B-M grid is a classic, and still very relevant. I like the model for it's simplicity. That said, in one important way, it oversimplifies to the point of missing an important aspect of managing a team - coaching for improved performance. The model seems to assume that employees are either doing something right, or not as right, while we also need to think about what an employee could be doing that is new and different, above their performance level or a stretch to their performance to help them really grow to the next level. To me, this is one of the hardest parts of managing people because it takes a lot more thought. It is easy to determine if someone did a task well or not but it is harder to identify new tasks that will help them grow. Thanks. You're right, the coaching and development part of a manager's job is not covered in this model. It only covers addressing performance problems. It could almost be another dimension, or another gird. In fact, I've used the nine-box performance and potential model as a way to determine the appropriate coaching strategy to take for each employee. That's the part managemnet I enjoy the most - helping employees go from good to great, not dealing with performance issues. The matrix makes a good point. But I think I'd move avoidance to the bottom left - no action/ no impact. Bottom right is high impact on performance, right? This quadrant could really be the nirvana achieved through spending a lot of quality time in the managing quandrant (action/impact). I see managing as laying the groundwork for a high performance team - one that doesn't require a lot of day to day managing to achieve results. Low action/high impact reminds me of Ken Blanchard's point in the one minute manager. When I designed this, I was thinking by avoiding addressing a problem, the manager's lack of action would have a big impact - a negative one - on the entire team and organization. I then tried to represent the nirvana situation in the vacation quadrant. But as you and others have pointed out, there are a lot of different ways you can take this. That's why I think it would make a robust group discussion. Always a balance between motivating, enabling, pushing, and not micromanaging. Also depends who you have on your team. I really appreciate how it is broken down into quadrants. It's not just simplified to define a manager or management style but also the impact on the employees and the outcome. Great job.